We desire to plant TWO new churches in the country of Turkey. Join us in sowing the seeds of the Gospel of Jesus Christ where the Apostle Paul once planted churches in Galatia (aka Turkey) and is now 98% Muslim. Let us sow abundantly as to reap an abundant harvest. DID YOU KNOW? It only takes $400/month or $4,800/year to support one local pastor who will be equipped to disciple, teach and preach the Gospel of Jesus Christ. During the 2018 Christmas season, we raised $9,600, enough to plant TWO churches in Turkey. Because we have been successful in raising funds for two churches, we have decided to continue raising funds to plant another seven more churches by the end of 2020. Currently there are four additional pastors already equipped to plant churches in Turkey but lack the resources to begin. We hope to be a part of the answers to their prayers. Pastor Emre serves a church about an hour outside of Istanbul. The church is composed of about 25 attendees, most of them coming from Muslim backgrounds. A couple of years ago, Emre was contacted by the police that there was a plot to kill him. A conspiracy of almost 20 people had been planning to take his life. Two members of this conspiracy even started attending the church, pretending to be interested in Christianity. Emre so trusted these two that he even asked them to babysit his children. By God’s grace, this plot was discovered just in time. Emre, his wife and two young children are safe. But some of these conspirators are still free as a trial drags on. Please pray for the safety of this dear brother in Christ and his family! ​In the wake of the horrific event, October 1, 2017, as innocent people were mercilessly gunned down, our city is sieged with fear and pain. Evil manifested itself in the most ugliest way. Our city needs God's love to manifest itself in the most excellent way. Let us unite and descend to our knees in prayer and at the same time rise up to our feet as an army of God's love. Let the light of God and the message of love push back the darkness of evil and triumph over it. Let us overcome evil with God's love. Let us bear the arms of love and extend unconditional love to the suffering and the lost. Let our worship of God manifest itself in our acts of loving kindness. Let us respond without hesitation and conquer evil with good. Thank you God for an amazing church family that truly lives out the Gospel of love and light. JOIN the MOVEMENT: Provide shoes for every child at a title one school in Las Vegas, where 90% of the children live below the poverty line. Our goal is to raise $10,000 ($20/shoe for 500 kids). Let's help the children of Vegas. ​MISSION ACCOMPLISHED: It took an entire congregation of generous people and an army of church members to put shoes on 500 children. 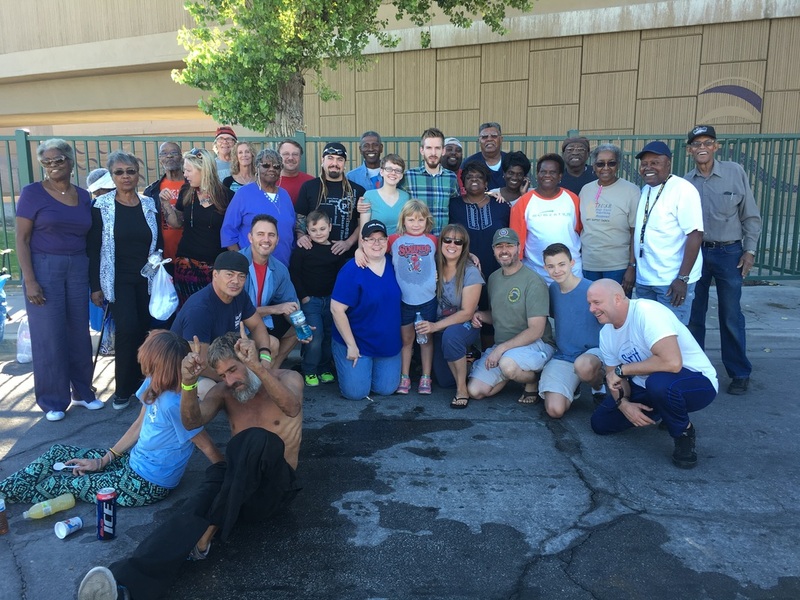 Thank you to all who participated in sharing God's love to the needy and the poor of our city. 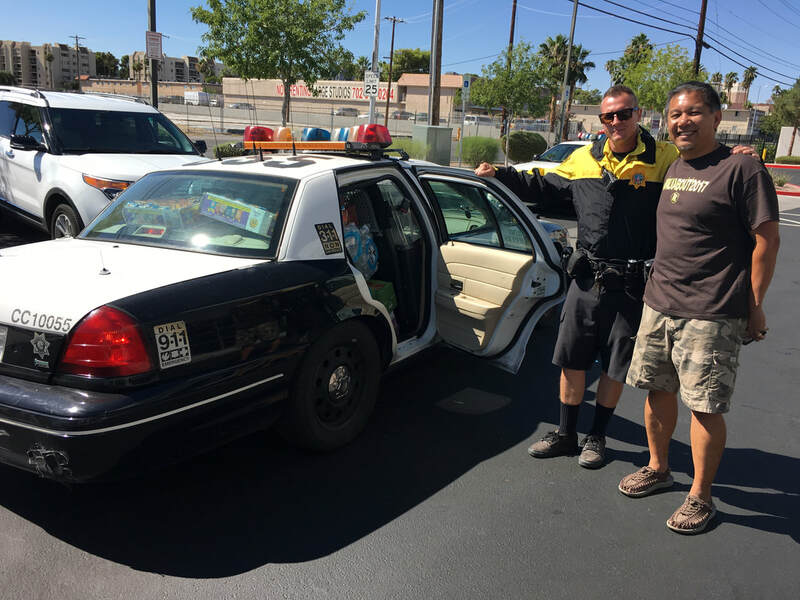 View the video link below to see what God and HIs people have accomplished..
Every year, we host a FREE community BBQ and activities for the families of southwest of Las Vegas. Literally everything is FREE. We serve up hamburgers, hot dogs and sodas along with homemade sides and deserts. There are activities for children, youth and adults. Our desire is to simply bring people together as we express God's love in tangible ways. Join us in reaching out to our communities of Southern Highlands and Mountain's Edge. Call the church office to help us plan, recruit and execute. We are active partners with Bret & Jorie Holman as they have planted a new church in Reno, NV. We've raised funds for their start-up cost and continue to support them financially since 2015. We are excited about what the Holy Spirit is accomplishing through their ministry. If you would like to contact them or support their ministry please go to: allpeoplecc.com. We are partnering with a title #1 school where over 90% of it's students live below poverty line. Our church has committed to join the staff and "Village of Hope" (a non-profit) to provide clothing and non-perishable foods for their assistance program. We are also volunteering to mentor children, assist programs by Village of Hope, organize the food distribution, and provide a Christian based ministry and outreach to children and parents. Our goal is to provide hope and encouragement for the next generation. 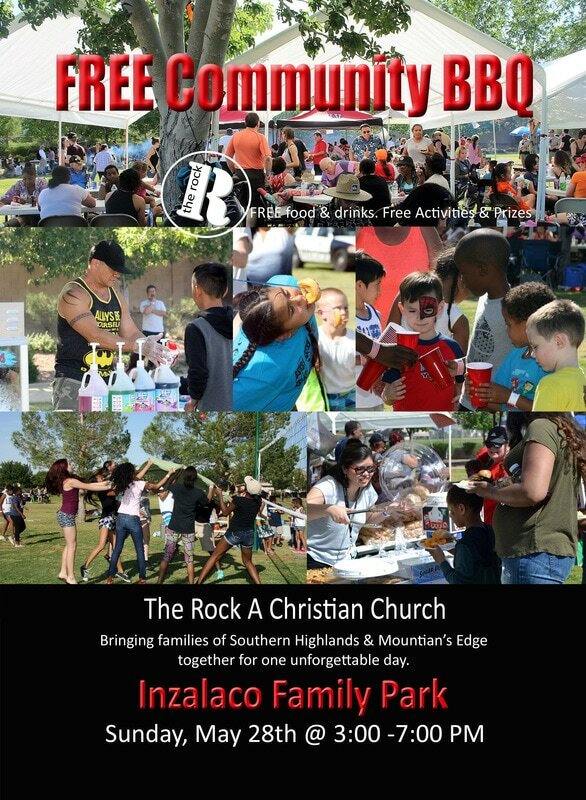 If you would like to join this movement, please call the church office at 702.340.9202 or if you would like to help financially, you may make a donation through paypal "donate" button below or send your donations to The Rock A Christian Church and designate it "Whitney Outreach." This past Christmas, we raised $3,500 exceeding our goal of $3,000. The extra $500 was donated to Village of Hope while the $3,000 went to the food pantry at Whitney Elementary. We also provided 500 shoes for the children of Whitney Elementary. See video link below. Every 3rd Saturday @ 8:00 AM...Bring your unwanted clothes, shoes, sleeping bags, tents, etc. and come and help us touch the lives of our homeless friends by serving them a hot BBQ meal and spending time listening and sharing our faith.